Umamimart is hosting another fun Umamiventure, this one is a ~VISIT TO SUTTON CELLARS~ in the Dogpatch this Sunday January 30th. 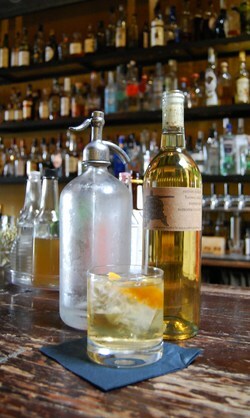 It’s all about vermouth, delicious, complex vermouth (hell, Sutton’s is so good that The Alembic has it on tap). I love the event writeup (check it out here), but here’s the gist: a meet and greet with fellow guests over a Sutton and soda; a brief tour of the winery and Vermouth Lab; a comparative tasting of six vermouths with a discussion on the history of the spirit, its various styles, and in relation to other botanical alcoholic beverages; deconstructing the Sutton vermouth, and a tasting of three separate botanicals macerated in base wine alongside the finished product; discussion and Q&A about the specifics of Sutton vermouth production and bottling; and a martini hour, with two different locally produced gins mixed with Sutton vermouth for a side-by-side comparison. Seriously, that is one hell of an awesome event. 2pm. $25 advance, $30 at the door. The Dough Room, photo by David White. 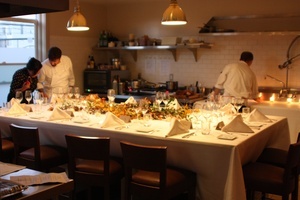 ~FLOUR + WATER~ is taking full advantage of their private “Dough Room” these days with a variety of private events. 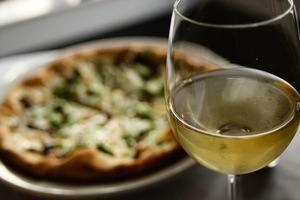 First up, a winemaker series on Monday nights, with pairings from Skylark on January 31st, and Palmina on February 7th. Chef Thomas McNaughton will be preparing a five-course tasting menu, with two pairings per course (whoa). It’s an intimate affair, with room for 12 max. $130; tax and gratuity extra. The first seating for these dinners (6pm) is sold out, so only space for the 9pm seatings remain (quite the way to start the week, right?). Reservations: 415-826-7000 or email. And then on Tuesday February 8th, The Bon Vivants (Josh Harris and Scott Baird) will be doing their own five-course cocktail pairing dinner, creating cocktails made only from ingredients that are legally served under a beer and wine license: think, sherry, beer, vermouth, some amari, etc. Both the cocktails and the cuisine will be prepared directly in front of the evening’s guests, and you can sure as hell expect some stories, laughs, and more. Space is limited to 10 people. $150, all inclusive. 7pm-10pm. Reservations: 415-826-7000. ~THE LIBERTY CAFÉ~ is relaunching its wine bar in the back (a former carriage house) on Tuesday February 1st, and will be open Tue-Sun evenings. Chef Matthew Marcus has created a special wine bar menu that is available each night. There will also be a series of wine events, like a free wine tasting on Thursday February 3rd focusing on the wines of Piedmont (6pm-8pm), with live music and complimentary hors d’oeuvres; Thursday February 10th will feature the tempranillos of Alejandro Fernandez, 6pm-8pm; and Thursday February 24th will feature a cooking class and wine pairing dinner from 6pm-9pm, $50 for the class, dinner, and pairings. 410 Cortland Ave. at Bennington, 415-695-8777. Thought you should know that ~VINYL~ is now open in Cafe Divis, open nightly at 5:30pm-11pm, pouring a selection of California wine and craft beer, and serving cheese and cured meats (you can read more on the offerings here). And starting in February, Casey’s Pizza will be serving their pizzas on Wednesdays. 359 Divisadero St. at Oak, 415-621-4132. And just a few blocks away, ~NOPA~ is offering all 10 crus of Beaujolais on the bottle list, plus rotating by-the-glass options. I got a chance to catch up with Paul Owens of Tortilla Heights about his upcoming project that is moving into the Gravity Room space in the Marina (yeah, fatal gang shootings in the club are so last year). It doesn’t have a name yet, but stand by for more on this in a sec. The space is going to have an old gentlemen’s club vibe, but also be very “come as you are” (so if you’re in the Marina, I guess that means UGG boots will be totally okay). The designer is Kendall Friedman, who does high-end residential projects in Pac Heights and Tiburon. There will be new bathrooms, a new sound system, and other updates. There will be a menu of four signature cocktails that will rotate, and there will also be a well-selected list of wines and Champagnes. As for the programming, Owens is planning on having guest bartending on Wednesday nights (something one of his past bars, The Fishbowl, is well known for), bands on Thursdays, and DJs on the weekends. 3251 Scott St. at Chestnut. Now, about that $1,000. Owens is willing to offer $1k, in cash, for anyone who comes up with the name they end up choosing for the bar/club. He wants it to have a traditional and strong tone to it—think old New York or London gentlemen’s club, but a place where you can let your hair down (over good cocktails). Obviously it’s going to draw an energetic crowd that wants to have fun in that neighborhood. Feel free to send some names in here by midnight on February 14th, 2011, and he’ll then sort through the names and see if there’s a winner. Please be sure to include your name, contact info, and address so he can reach you. 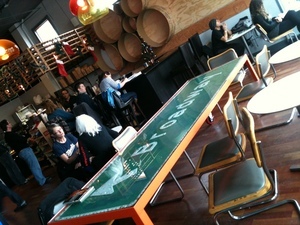 Photo from SF Beer Week. The ‘hopper is a fan of hops, and is therefore stoked about the upcoming ~SAN FRANCISCO BEER WEEK 2011~, which is running from February 11th-20th. 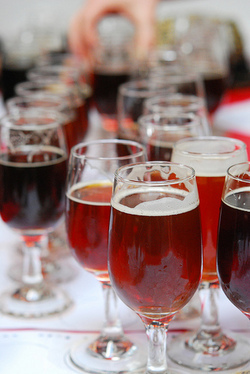 The event lineup is pretty hefty, starting with the Opening Gala at the Yerba Buena Center for the Arts on February 11th with over 35 breweries in attendance, followed by a bunch of festivals, classes, special beer dinners, pig roasts, beer-and-bacon PJ brunches, beer-making classes, a Beer 2 Brakers SF bike tour, pairings and special pours all over town, a “Booze and Brew Brawl,” you name it. Don’t take my word for it, hop on over to the schedule. I received this heartfelt note from a tablehopper reader, Joanne Bowman, about the retirement of her favorite bartender, Roger Nissim, and felt impelled to share it. Here’s wishing him a very happy retirement, and making excellent cocktails for his wife at home: “I thought you might like to know that Roger Nissim, who has been a bartender with ~FOG CITY DINER~ since they opened in 1985, retired this week. I attended a retirement bash for him at the Diner on Tuesday evening with about 100 people to wish him well. The party was put on by the Diner and his wife, Joanne. The Diner was closed for the evening for his party. You may remember he was in the VISA commercial and has been a wonderful ambassador for both the diner and San Francisco. He is a true gentleman and a great bartender. I will miss his presence at the Diner with his coiffed hair and mustache and manicured nails. He is almost 70 years of age. 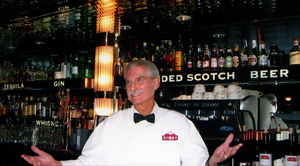 He is one of the best old-time bartenders around and entertained people with his spoons and soft shoe routine while working behind the bar. He will be sorely missed.